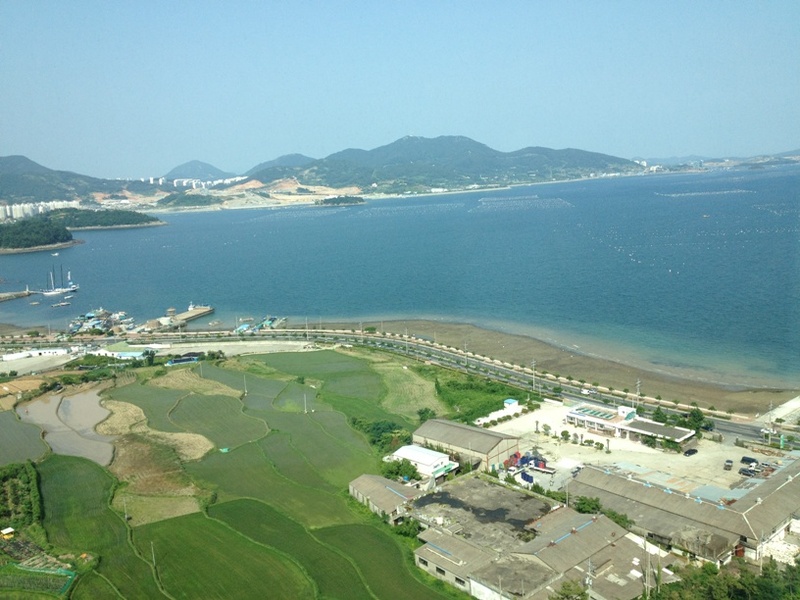 This post is a photo diary of our visit to the World Expo in Yeosu (pronounced yo - sue). If you're looking for the deets on travel, lodging and Expo info check out the logistics post here. When you arrive through Gate 3 one of the first sights you'll see is this magnificent 50,000 LED screen ceiling display. 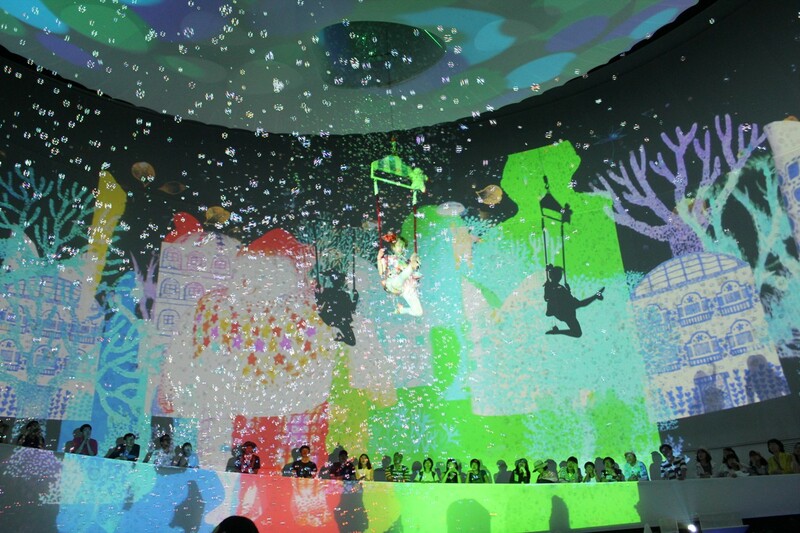 The scenes ranged from ocean waters to other cultural videos and were mesmerizing! Made us want to layout a picnic blanket and just gaze. Our 14th floor hotel ocean view at The Ocean Hotel. Actually, the theme of this World's Fair is all about the ocean and how we can learn, utilize and save it. This is called the Big-O and it is the main landmark for the Expo and the backdrop for various shows on the open sea - including the nightly show that utilizes water, fireballs and lasers coming from the huge device. Note: The show also was truly Korean as it included a fairy with a coffin, Superman, a fat French man and a crazy man at a desk - no matter how hard we tried we couldn't deduct the storyline (reminds us of the Lotte World production we saw that included the cast of Wizard of Oz... and Pinnochio). Besides all of the main pavillions and displays there was also an impressive collection of street entertainment including this 4 story tall wooden puppet. The puppeteers on the backside could maneuver him to walk, sit, stand, and move all of his limbs and head. The puppet even had a new outfit on each day! Another example of street entertainment were these terrific illusions. Yes, this is a real man seemingly floating in mid-air. Another illusion was of a man that looked as if he was floating high up on the support posts - his only contact was by hand. If I wouldn't have (unfortunately) seen how they performed the illusions I still would be scratching my head! 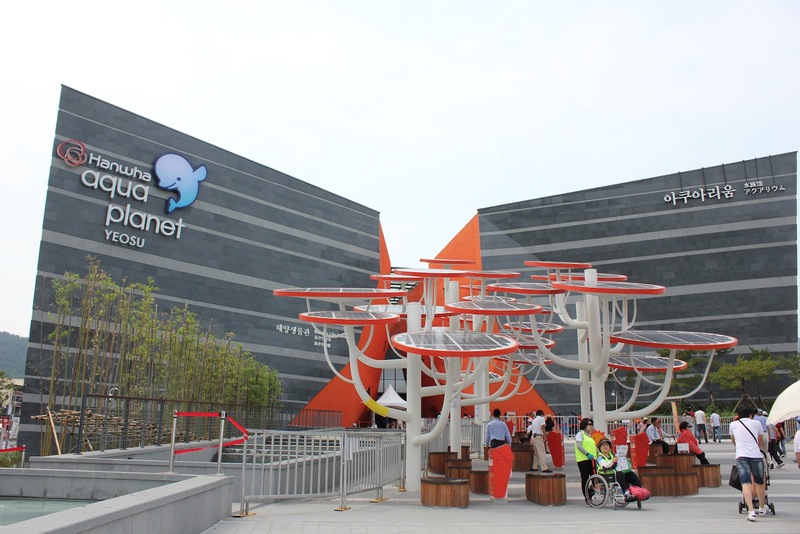 The Expo includes several zones that include pavilions of every kind. We weren't able to go to every one but we were able to go to most. The only dissapointment was that we weren't able to go to the Robot Exhibit because of the 3 hour wait time. If you are unable or unwilling to wait in line as well here's a YouTube video we found documenting the exhibit. 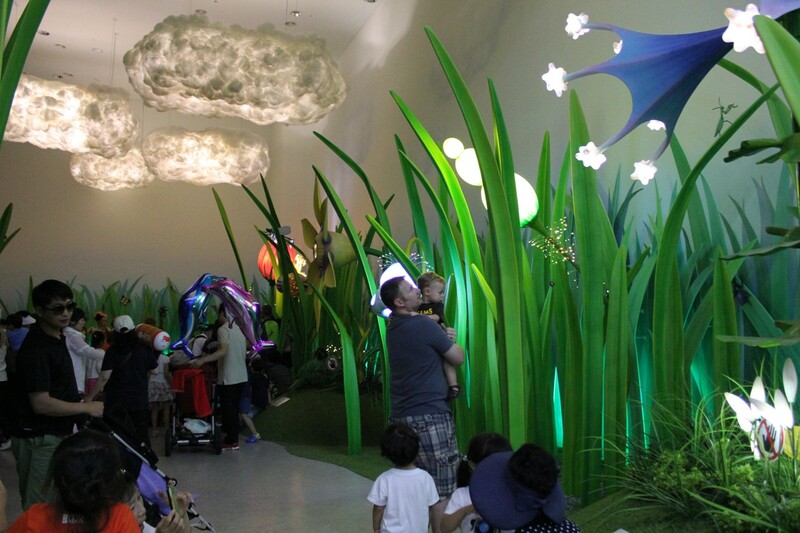 The Lotte pavilion was a kid-friendly exhibit with a carefree atmosphere. Pictured is the "holding pen" area before the main show. All of the flowers opened and closed and there was a Korean show put on by actors on a little stage to the left. Cooper didn't care for the show or the moving flowers but he was into the balloon ride to come. At Lotte they had one of only a couple of "rides" that was pretty cool! 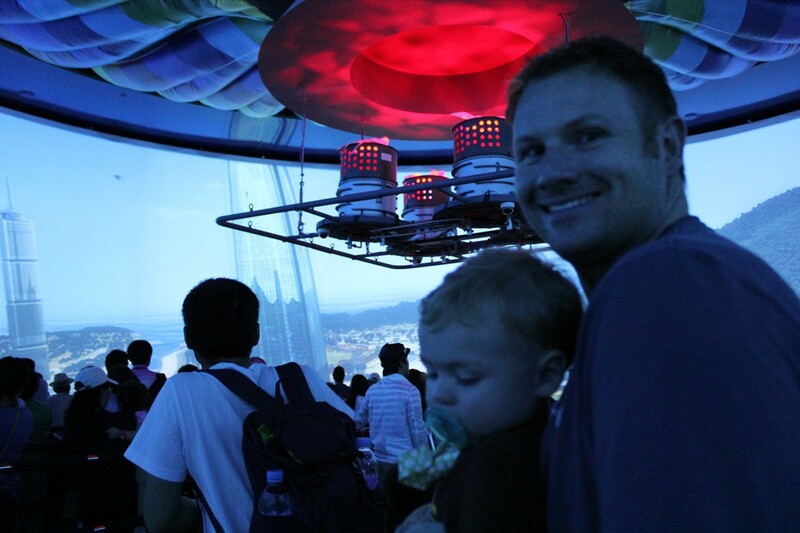 The hot air balloon ride included a moving platform and a simulated burner (pictured above) and all worked in conjunction with the 360 degree display of different environments including the Expo, forests, oceans and more. Cooper looks so tired here because... he is - after 10 hours so far at the Expo we were trying to hold out for just a bit longer to catch the finale fireworks and water show! The POSCO pavillion is definetely worth it for older kids. It was like a kid party with a colorful light show, acrobats coming down from the ceiling and tons of bubbles. It was kinda' Coopers worst nightmare - I had to back up with him all the way into the Exit until we were far enough away from the acrobats. 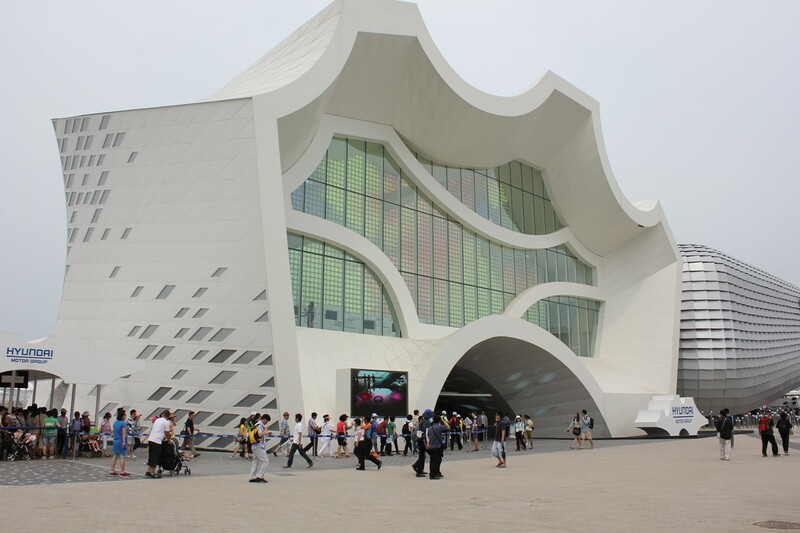 The aquarium is one of the most sought after exhibits. 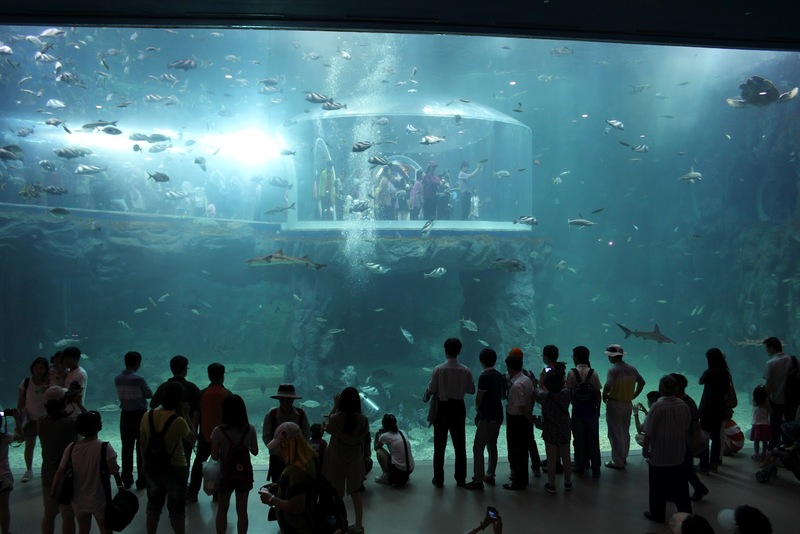 Pictured here is one of the largest single aquarium windows we've ever seen. And inside this larger tank is another viewing area you can see in the middle here. The wait was typically 2-3 hours long but for some reason we were rushed all the way in front of the line right to the entrance. Could be the stroller, or the cute baby but we'll take a 30 second wait over 2 hours any day! For our non-stroller/cute baby toting friends they agreed that an hour was the longest you should wait. Also, once inside it was extremely packed with (literally) pushy Koreans at every turn. 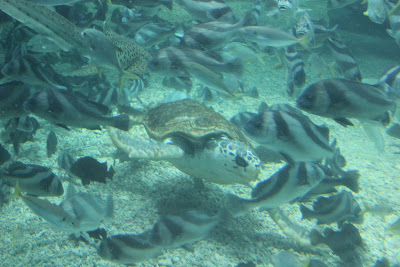 Inside the main aquarium were fish of all kinds, small and large sharks and Giant Turtles. Pictured is one of the turtles on a turn only a foot or so from the glass. He was at least 3 times bigger than Cooper. At the aquarium was this fun little display. Cooper was so interested in the fish swimming around his head that we couldn't get him to look at the camera once! The Aqua Planet wasn't our favorite exhibit but the solar panel trees running the building were very cool indeed. 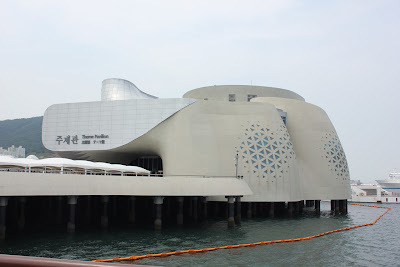 Another Theme Pavilion right on the ocean. In addition to the dozens of pavilions and exhibits there were hidden pieces of art every where you turned - all with a common theme. This was a large waterfall wall between the international pavilion area and larger exhibits. Cooper's well-earned break at the waterpark. He played for an hour straight and had the best time. 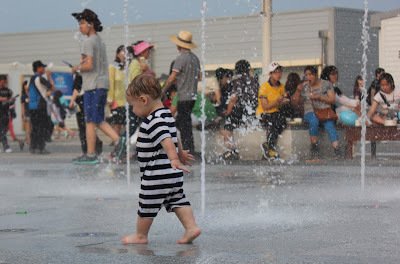 We took a ton of Cooper pictures and so did every other Korean there - actually, a little unsetteling when you look up and there are 10 people video'ing your child. He is a Korean rockstar. Here's one of him right after a stream just missed his face - ha! He loved every second! We didn't anticipate to love or spend as much time at the International Pavilions but they were our favorite part. Each country had their own exhibit that included displays, videos, entertainment, interactive elements and even dance parties! Some of the pavilions also had their own restaurants. It was also impressive that people from each country worked their own pavilions and almost all also spoke English - a nice change of pace! Most every exhibit did not allow photos or videos so we don't have a lot but we did sneak just a few. France was one of our favorite exhibit - several really interesting displays made for a cool experience. This is a shot of a large aquarium housing robot fish. Daddy and Cooper are on the other side where you can also see walls made of tiled mirrors. Russia's exhibit was one of Owen's favorite. This is a life-sized ship and all around is an LED ocean. The entire exhibit was chilly and covered in faux ice - very well done Russia! Note if you go to this exhibit make sure you get to the front of the pack for the best view. Thailand did a great job bringing people into their exhibit with an impressive entrance . The statues move and talk and every 15 minutes there is a traditional, live singing and dancing show. Cooper was a trooper - with a 12 hour and then 13 hour day, no crib, only Korean milk (which he doesn't like) and constant Korean oogling - he did great! Bye! Bye! Yeosu! Thanks for hosting a great World's Fair! The Expo looks awesome, and that picture of Cooper is adorable! My oh my, he's got a little wave to his big boy hair. 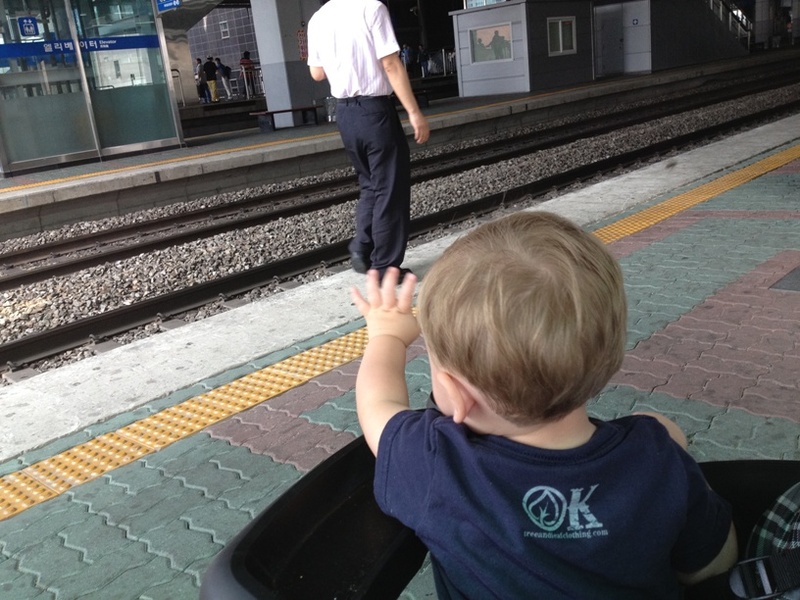 Seriously, Kande -- heart melting cuteness. We miss you! Thanks Sarah! Do you recognize the tee - it's from his very good friend Milo :) Hope y'all are doing great. Give Milo a fist bump from Coop! You must be busy. 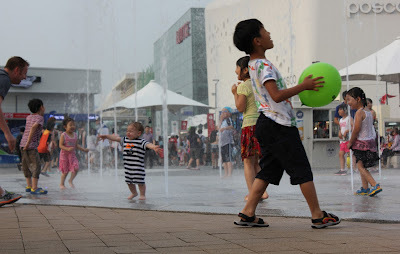 Have not seen a new blog in a while. Hope you are feeling well too. Cannot wait for the new one. Love you!